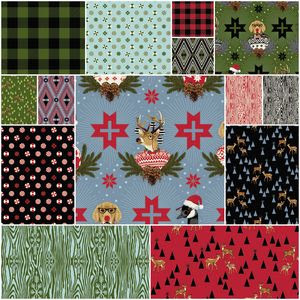 Once again, Sarah at Confessions of Fabric Addict is hosting the 12 Days of Christmas in July Blog Hop. And it starts today, July 14th and ends July 25th. It's never to early to start thinking about handmade gifts and holiday decor. Sarah has a great tutorial on her blog today! Sarah has six design rolls, six layer cakes, and one fat quarter bundle to give away - and here's how she's going to do it! Visit each stop on the hop, including Sarah's, and leave a comment on each post for the day. At the end of the hop, she'll do a giveaway for each day by putting everyone's name in the hat who commented that day (from all that day's hop-blogs), and draw a winner for that day. The twelve winners (one per person) will receive the design rolls and layer cakes. Then she'll put all the names from all the days in a hat and draw out a grand prize winner for the fat quarter bundle! Only one prize per person, though - let's spread it around a bit! So carve out a bit of time to visit all the blogs and comment. Giveaway open to all, so international comments are welcome! I must say that your guidelines and schedule will make me able to make something good to prepare for the Christmas.